Today, we're learning how to cook a perfectly tender Pata Tim! Think it's too hard? Not really! Our recipe is easy to follow.Here's an Asian-Style Braised Pork Leg with the meat practically falling off. 1. 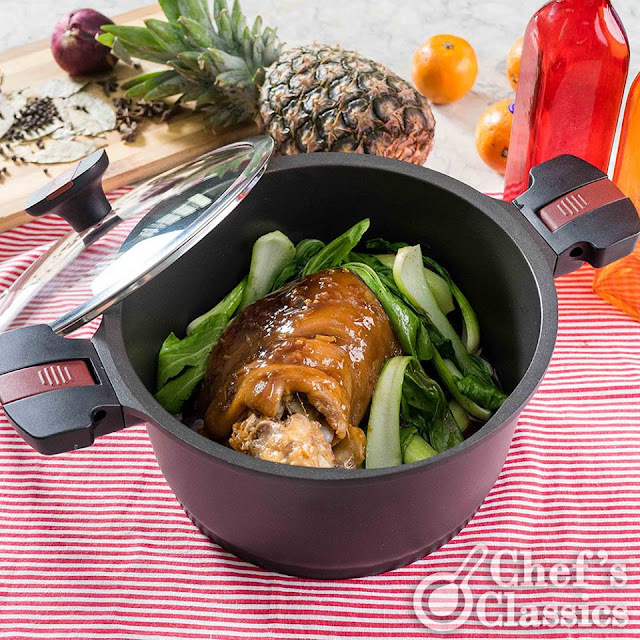 Place the pork leg or the "pata" inside a Chef's Classics Caper Casserole with water, soy sauce, oyster sauce, sugar, pineapple juice, pepper corns and garlic. 2.Add the star anise and sesame oil. Simmer for an hour or until pork is tender. 3. Remove the pork leg and set aside. Add slurry to the pot. Let it simmer until sauce is glossy and thick. 4. Place the pork in the middle of a serving plate then serve with blanched bokchoy. Don't forget to pour the sauce over the pork and vegetables. 5. For an extra touch, garnish the plate with chopped spring onion or coriander leaves.